Customizable WorkPoint Treeview – Welcome! How can we help? Setup your own layout of the WorkPoint treeview*. You can, for example, choose which business modules to show and in which order they are shown. Now you can choose which business modules you would like to be able to search in as well as the order, in which they should appear. Choose whether or not a business module should be shown or not by respectively marking it or removing its marking. Change the order in which the business modules appear by clicking the arrows to the right of the business modules. The order and representation of businessmodules on the Search tab is now changed. Finally, you can choose which lists you would like to have shown in the result of a search and whether or not they should be expanded automatically. You choose those settings in the panel “Search Tree Elements”.In version 4.3.0.0, you can only choose not to display the “Relations”-list, – which contains an entity’s relations. You do so by unchecking “Show” next to “Relations”. 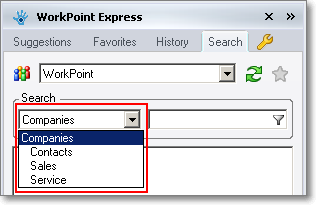 If you would like to have WorkPoint® Express automatically expand e.g. document lists, you must check “Expand” next to the list in question. With settings like in Figure 1, WorkPoint® Express will automatically expand the document list(s) of the entity, you have searched for. If you use more than one WorkPoint® site which has EMM, you must choose which of them should be your primary installation. The primary installation is, for example, used when you use WorkPoint® Express to journalize an email. Similarly, WorkPoint® Express uses the primary installation when fetching journalization information about an email. The first time you start WorkPoint® Express after having added a second WorkPoint® site with EMM, you will be asked which of them to use as your primary installation. If you wish to change your primary installation afterwards, you should go to the “WorkPoint” tab of WorkPoint® Express’ settings (see Figure 3). Here you can choose your primary installation by checking the installation in question.